This He-Man action figure was originally billed as being "evil." The cartoon, however, made it pretty obvious that he was a neutral figure who leaned very heavily towards the side of good. As far as characterization goes, I take most of my cues from the cartoon, so I'm filing him under the good guys. This time, the static pose was actually intentional--meant to emphasize his supposed neutrality. The holographic globe (which is meant to emphasize his cosmic nature) is just something I came up with, as far as I know. It's possible that my brain pulled it out of the subliminal depths of long forgotten He-Man episodes from my misspent youth. But those episodes won't be forgotten for long--I do plan on completeing my He-Man DVD collection soon. The costume tweaks that I made on this design are rather similar to the modifications that I made in my illustration of Tri-Klops--I consolidated the harness from his chest plate with his belt to avoid a redundant-looking double-belt, and I 'covered' his neck. The covered neck on Zodac, as with Tri-Klops, is inspired by the 200x version. The rest of the costume is pretty much straight up from the original. i love it! i also love lamp and rasslin'. The left leg, whie ur static pose excuse i mean idea is worthy, looks much MUCH too static. In fact, if you concentrate on teh leg alone u'd swear u were staring at a tree. not sure if i like the claw0like flechy digits. was he like that in the cartoon? just wonderin'. so the rock has posted his billionaire predictions on WWE.com. the rock would make a good zodac in the movie. Always with the furry underpants. Sailing through space? Furry underpants. Living underwater? Furry underpants. Hanging out in a cave? Furry underpants. Kickin' it in an ancient castle? You better believe that's furry underpants. lordshen: i think i agree with you about the stiff leg. zodac had normal boot-feet in the 'toon, but the toy had feet like skeletor, so i gave him the claw-feet for more of an alien feel. 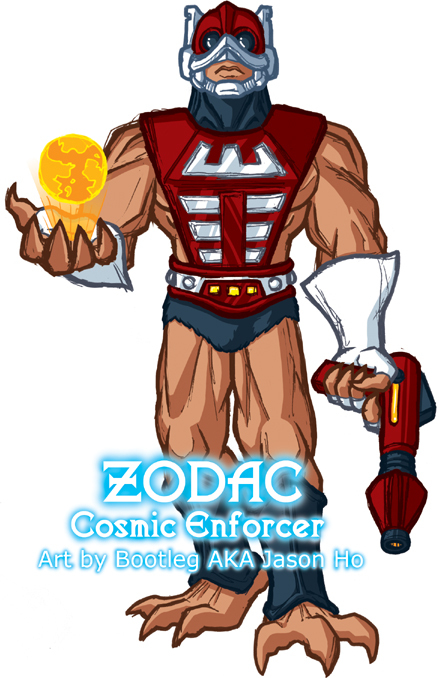 and the rock would be a rad zodac! illgnosis: thanks for the tip--i have been attempting some controposto in my gestures since you wrote this comment, and i like the results! mark: as the internet acronym goes--LOL! seriously, i laugh everytime i think about this comment.